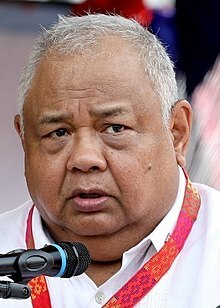 Salvador "Bingbong" Campo Medialdea (born October 14, 1951) is a Filipino lawyer, business executive and government administrator who is the current Executive Secretary of the Philippines, succeeding Paquito Ochoa Jr. at the start of President Rodrigo Duterte's term on June 30, 2016. Medialdea is the son of former Supreme Court Associate Justice Leo D. Medialdea who served from 1988 to 1992 under President Corazon Aquino. Born in Manila, Medialdea spent his early years in Davao City, where he was a childhood friend of President Rodrigo Duterte. He attended the Light Bringer School in the city before moving back to Manila to finish high school at Paco Catholic School. He received his BS Commerce Major in Management from Colegio de San Juan de Letran in 1972 and his law degree from San Beda College of Law in 1976. He passed the bar exams the following year. Medialdea began his legal career as a senior associate at ACCRA Law Offices. He then worked as a partner at Pecabar Law Offices, the law firm of Senators Juan Ponce Enrile and Rene Cayetano, before becoming a managing partner at Medialdea Ata Bello Guevarra Suarez Law Firm (MABGS). From 1998 to 2000, he served as chairman of the Northern Foods Corporation based in Sarrat. He began work in government in 1998 at the Livelihood Corporation (now National Livelihood Development Corporation) upon the invitation of President Joseph Estrada. He became a member of the board of trustees and administrator of the government-owned corporation while also serving as chairman of the Guarantee Fund for Small and Medium Enterprises. In 2000, he was appointed by Estrada as presidential assistant for political affairs. Medialdea still serves as partner at the MABGS law firm, whose clients include President Duterte. He is also director for Manchester International Holdings and Accette Insurance. He also served briefly as bar examiner for the Supreme Court in 2006. Medialdea is married to Betty Dizon, a lawyer and head of an insurance company, with whom he has one son. His family has roots in Davao City, Aklan and Ilocos. Outside of work, he enjoys playing piano and classical music. He was one of the producers of Miss Saigon in Manila in 2000. ^ "Certification of Independent Director" (PDF). Melco Crown Philippines. Retrieved 26 June 2016. ^ Ranada, P. (16 May 2016). "Medialdea is executive secretary, Panela is spokesman". Rappler. Retrieved 26 June 2016. ^ a b c d "The Duterte Cabinet". Interaksyon. 1 June 2016. Archived from the original on 9 June 2016. Retrieved 26 June 2016. ^ a b c Herrera, C. (23 May 2016). "Executive secretary is a mean piano player". The Standard. Retrieved 26 June 2016.